First time on the market in almost 30 years, the historic "Grandview", ca 1909, offers a glimpse into Ridgefield's storied past. Per the Ridgefield historical society, "Grandview was the location of Colonel Armand's barracks in 1779 (Revolutionary War). The estate is so named because it is built on the side of West Mountain overlooking Pierpont and Mamanasco Lake with a view of the Hudson". It is thought to be one of the highest points in Ridgefield. Originally built as a hunting lodge, the current estate was developed in the 1930's by Benjamin E. Levy, founder of the American branch of the French cosmetic company Coty. At one time the estate included more than 300 acres, part of which is now Levy Park off of Barrack Hill. 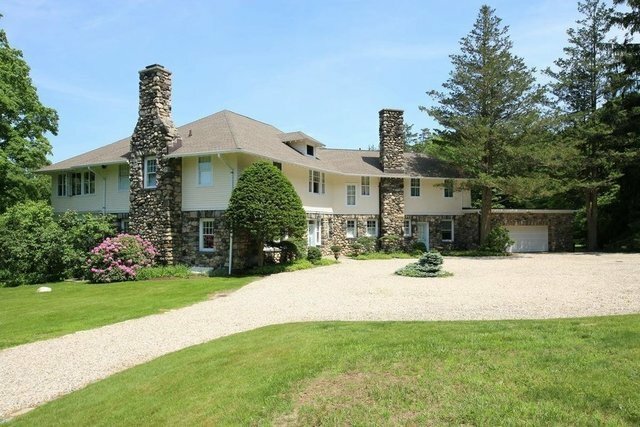 The lower half of this magnificently constructed, English Arts & Crafts style home, is built of field-stone, and features 3 massive stone chimneys corresponding to 3 colossal fireplaces, each featuring a single slab of granite mantle piece. Original period details throughout, yet thoughtfully updated including chef's kitchen with professional appliances and remodeled baths. This grand home offers 6,021 square feet with 6 bedrooms, 5/2 baths and expansive rooms incl. 28'x18' dining room; original windows/doors; glass walled sun-room; butler's pantry with original drain boards and cupboards; sleeping porches; and sweeping stairway to the 2nd floor. Stunning 4.27 acres with circular drive; most impressive stone walls, terraces and gardens including vine covered pergola; all just 5 minutes to town and approximately 1 hour to NYC.